Sophomore Austen Ancell overcame fierce winds and a four-stroke deficit behind a former state champion to win the individual state golf title on Tuesday. The Trojans golfer carded a two-day 150 to win the Division I-A state golf tournament held in Truckee, California at the Grays Crossing Golf Course and the Old Greenwood Golf Course on Monday and Tuesday. 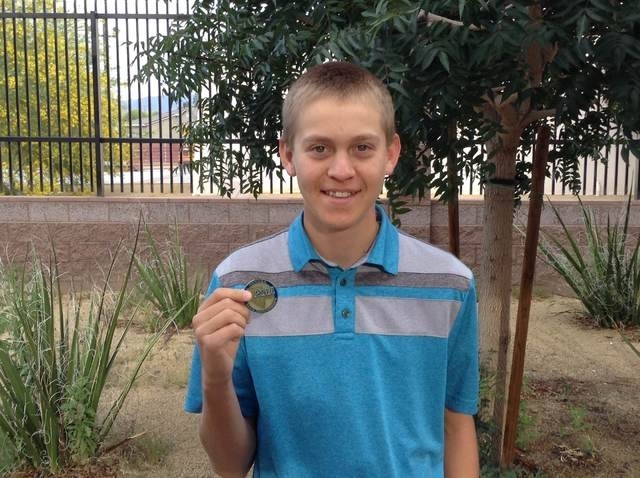 According to Trojans golf coach Robert Hopkins, Ancell is Pahrump Valley High’s first golf state champion. Ancell entered the second day of competition with a four-shot lead on three golfers after shooting a 1-over-par 73. The group in second place included 2013 state champion Luke Logan of Boulder City, who was playing in the group with Ancell. Logan was fresh off his fourth I-A Southern Region title May 5-6, a tournament Ancell finished in eighth place, 16-strokes back. On the second day, Logan slowly whittled away the 4-stroke lead that Ancell had built up. The two were even by the par-4 13th hole. This hole would be Ancell’s worst of the whole tournament for he shot a nine, and Logan shot a five, giving Logan a 4-stroke lead, but Ancell didn’t lose his cool. “There was a little bit of pressure playing with Luke because I knew he was a good golfer,” he said. Coach Robert Hopkins said he wasn’t surprised he won after the first day’s scores. The surprise came later. Something inside Ancell kicked in. “What kept me focused was that I had given up so many strokes, I knew I had to push hard to get back those strokes,” Ancell said. Hopkins said Logan helped Ancell out on the next hole. “Luke hit it in junk and took a 6 and Ancell birdied the hole and took back three of those four strokes right away,” the coach said. The golf was touch-and-go for the last five holes. Hopkins described a shot on hole 15 leading to the pin. Ancell ended up getting four of five birdies on the last five holes, which the coach said was remarkable. “I have never seen a Trojans golfer do that before,” Hopkins said. Ancell took back the lead on 16 by two strokes then gave back one on hole 17. Going into the final hole, Ancell held onto a 1-stroke lead on Logan by hole 18. Ancell saw Logan get on the green of the par-5 hole on three shots. Hopkins said Logan hod to three putt the last hole. Finishing third six strokes back was last year’s individual champion, Charlie Magruder of Faith Lutheran. According to Ancell this was not the best two days of golf he played, but the best in a tournament setting. “I have not had good tournaments this year and I finally put one together,” he said. According to Hopkins, Ancell, who finished 12th at state last year, is the first Pahrump Valley player to finish near the top in a few years. “We have not had a state placer since Cameron Belcher got second his senior year and Shane Lindeman got third or fourth around 2007,” Hopkins said.